There must be a literary term for taking past works— paintings, books, poems, papers—of people and reformatting them in an intelligent way so that the end product makes sense in today’s world. One of the best examples of this that I have seen is an interview Wired magazine carried with Nikola Tesla, the late 19th-early 20th century physicist who is responsible for much of modern electrical and magnetic systems. The Wired interview was all art (and science). The writers (Marc J. Seifer and Michael Behar) posed questions, and then culled answers from Tesla’s writings. Universal peace as a result of cumulative effort through centuries past might come into existence quickly—not unlike a crystal that suddenly forms in a solution which has been slowly prepared. Brad ’61 is a comic book or graphic novel that follows the same model. It is an old book (it was written in 1993 by Tony Hendra). 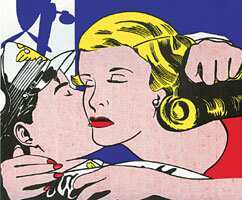 And it is illustrated by Roy Lichtenstein. Actually, that isn’t entirely accurate. Hendra takes some of Lichtenstein’s works from the early 1960s and weaves a story around them. Lichtenstein, of course, was the famous pop artist whose works of appliances and people were dismissed as superficial and nothing original by comic book artists who felt he was essentially using styles and colours perfected by them. Hendra’s work, which tells the story of an artist named Brad (and uses works from the early 1960s, which could explain the name of the book) is as good as the Tesla interview Wired carried. And Lichtenstein’s illustrations give it a nice pop feel that brings to mind the work of golden age comics. As a comic book, Brad ’61 probably has more novelty value than anything else. Then, graphic novels are meant to be very very graphic and very very novel and Brad ’61 fits the bill.